February 13, 2019 SSLeave a Comment on Burndown Chart: What Is It & How Do I Use It? At times it feels like there’s never enough hours in the day to get everything done. Often, the powers that be want things done yesterday, even though it’s an impossibility. They know that, of course, but their intent is clear: get it done fast. Therefore, clever managers know that time is a constraint which they’re always working to control. The better data they have related to time and work, the better they can adhere to the schedule and get the project completed on time and within budget. A burndown chart is one such tool for collecting that project data. Using a burndown chart is a means of seeing how much work is left to do and how much time there is to do it in. It’s a graphical representation, offering in a picture what a thousand words might not be able to communicate as clearly. A burndown chart is a graphic representation of how quickly the team is working through a customer’s user stories, an agile tool that is used to capture a description of a feature from an end-user perspective. The burndown chart shows the total effort against the amount of work for each iteration. The quantity of work remaining is shown on a vertical axis, while the time that has passed since beginning the project is placed horizontally on the chart, which shows the past and the future. The burndown chart is displayed so everyone on the team can see it and is updated regularly to keep it accurate. There are two variants that exist for a burndown chart. A sprint burndown is for work remaining in the iteration. While when illustrating the work remaining for the entire project, the chart is called a product burndown. The burndown chart has several points. There’s an x-axis, which is the project or iteration timeline. The y-axis is the work that needs to get done in the project. The story point estimates for the work that remains is represented by this axis. The project starting point is the farthest point to the left of the chart and occurs on day zero of the project or iteration. The project end point is farthest to the right and marks the final day of the project or iteration. There is an ideal work remaining line, which is a straight line connecting the start point to the end point. It shows the sum of the estimates for all the tasks that need to be completed. At the end point, the ideal line crosses the x-axis and shows there is no work left to be done. This line is based on estimates and therefore not always accurate. Then there is the actual work remaining line that shows the actual work that remains in the project or iteration. At the beginning the actual work remaining and the ideal work remaining are the same, but as the project or iteration progresses the actual work line will fluctuate above and below the ideal work line. Each day a new point is added to this line until the project or iteration is done to make sure it’s as accurate as possible. If the actual work line is above the ideal work line, it means there is more work left than originally thought. In other words, the project is behind schedule. However, if the actual work line is below the ideal work line, there is less work left than had been predicted and the project is ahead of schedule. What Are the Benefits of a Burndown Chart? The obvious benefit of a burndown chart is that it provides an updated status report on the progress of the project. Having a visual representation of this most important data keeps everyone on the same page. Also, by displaying it prominently for all to see, it keeps everyone involved and encourages the team to deal with issues before they become problems. Therefore, the bigger the chart, the better. It should be the focal point of the workspace, so that it cannot help but direct conversation towards the project and its progress. The burndown chart is extremely helpful, too, because of its simplicity. It’s a great way to see the velocity history of the project. Velocity is an agile term that means the total effort estimates associated with user stories that were completed during an iteration. What Are the Limitations of a Burndown Chart? The burndown chart doesn’t reveal everything. For example, it only shows the number of story points that have been completed. The burndown chart doesn’t show any changes, for example, in the scope of work as measured by the total points in the backlog. Therefore, it can be hard to tell if changes in the burndown chart are because of the backlog items having been completed or because of an increase or decrease in story points. Having a burnup chart can resolve this problem by having a separate line in the graph for overall backlog size. However, neither a burndown nor a burnup chart offers any indication of which product backlog items have been completed. Therefore, a burndown chart might show progress but not whether the team is working on the right thing. So, these charts are a way to show trends rather than whether the team is delivering the right product back log items. Another issue with burndown charts concerns the accuracy of the ideal work line. Whether the actual work line is above or below the ideal work line depends on the accuracy of the original time estimates for the tasks. Therefore, if a team is overestimating time requirements, progress will appear on track if not ahead of schedule. But if they are underestimating time requirements, it will appear that they are behind schedule. There is a way to respond to this issue, and that’s by incorporating an efficiency factor into the burndown chart. Therefore, after the first iteration of a project, the efficiency factor is recalculated to allow for more accuracy. The burndown chart developed out of the Scrum community and was first used to manage software projects and other related efforts in about the year 2000. It was first described by Ken Schwaber, who is credited with its invention. At that time, he was working at Fidelity Investments and created burndown charts to provide Scrum teams with a simple tool to help them chart their progress. By 2002, the burndown chart was gaining in popularity within the Scrum community. It has since moved beyond Scrum as a useful tool for any manager seeking to chart progress on a project. Managers must keep their eye on the progress of a project. If they don’t, then they’re risking the successful completion of the project. 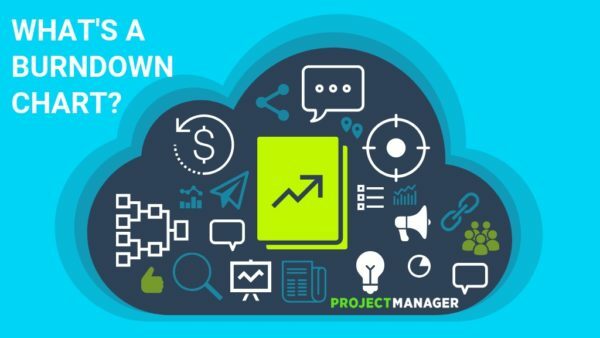 A burndown chart is just one of the many tools that lead to project success. ProjectManager.com is a cloud-based project management software that any manager will want to have in their toolbox. It has features such as a real-time dashboard to monitor and report on progress, and an online Gantt chart to streamline scheduling and help with collaboration. Try it today for free with this 30-day trial. The post Burndown Chart: What Is It & How Do I Use It? appeared first on ProjectManager.com.